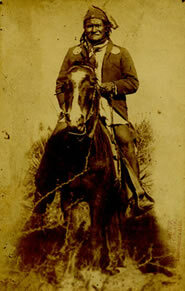 Dunham Studio Photograph, Geronimo, c. 1904, 5.25" x 3"
Even 100 years after Geronimo’s death his legend lives on. His name resonates throughout the world and is still frequently shouted by those jumping out of airplanes. 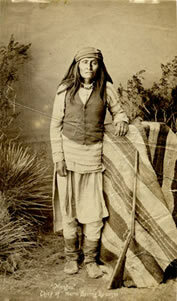 Charles Henry Carpenter, Geronimo, photograph, c. 1904, 9" x 7"
Born Goyathlay (“one who yawns”) on June 16, 1829, to the Bedonkohe band of the Apache, near Turkey Creey, in what is today Arizona, this warrior was named Geronimo by the Mexicans during a battle in which he repeatedly attacked Mexican soldiers with a knife, ignoring a deadly hail of bullets, in reference to their plea to Saint Jerome (“Jeronimo!”). The name stuck. 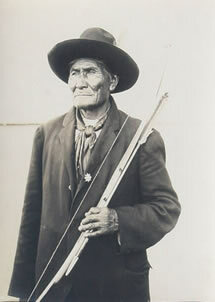 C. S. Fly (1849-1901) Photo of Geronimo No. 188, c. 1886, 8.5" x 5.25"
One of the last major forces of independent Native American warriors who refused to acknowledge the U.S. government in the American West, Geronimo became a celebrity in his old age. He appeared at fairs, including the 1904 World’s Fair in St. Louis, and sold souvenirs and photographs of himself. He also rode in President Theodore Roosevelt’s 1905 inaugural parade. 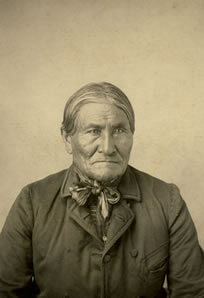 Geronimo died at age 79 of pneumonia on Feb. 17, 1909, at Fort Sill, Oklahoma. Ben Wittick (1845-1903) Mangas, Chief of Warm Springs Apaches, c. 1890, 7.25" x 4.25"
Medicine Man Gallery in Tucson celebrates Geronimo’s life as one of America’s best known Native Americans with an exhibition and sale beginning February 14, just three days shy of his actual death. Geronimo with Feathered Headdress, Ft. Marion, c. 1890, 5.25" x 3.75"
The show and sale will feature approximately 100 works, including 40 vintage photographs of Geronimo and his people, as well as Native American arts of the Apache and contemporary works by most of the gallery’s artists that pay tribute to the warrior’s legacy. There will also be historic works related to Geronimo such as movie posters and paintings done at the turn-of-the-century. 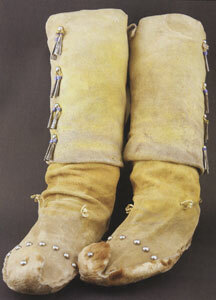 The show, titled Geronimo Remembered: A Retrospective 100 Years after his Death, runs through April 15, 2009. George A. Addison, Geronimo of Yesterday, Fort Sill, Oklahoma, c. 1890, 6.5" x 4.25"
The 40 photos span 1886 through 1909 and represent the largest group of historic Geronimo images available for sale at one time. The works in this sale come from the private collection of Dr. Mark Sublette, owner of Medicine Man Gallery. 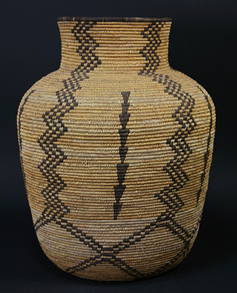 Apache olla, c. 1900, 19.5" x 16"
Nearly all the pieces in this exhibition are available for purchase. 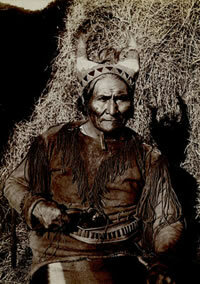 One photograph in particular that stands out, says Sublette, is titled Geronimo by Charles Henry Carpenter. 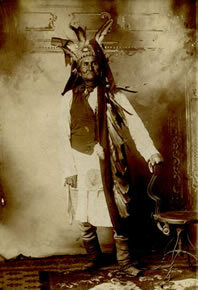 It shows the famous Apache warrior at the 1904 World’s Fair in St. Louis. 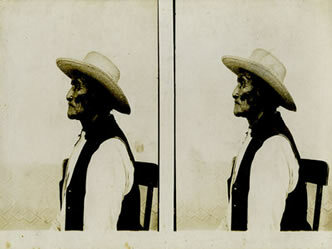 Geronimo Stereoview at Fort Sill, Oklahoma, c. 1890, 7.5" x 3.5"
“It’s a terrific image of Geronimo and it’s large and in pristine condition,” adds Sublette. 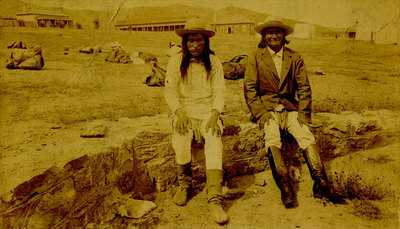 A. F. Randall, Natches and Geronimo, c. 1886, 4.25" x 7.25"